Caesar Park took top prize among hotels in Panama. Sometimes the inconsequential things stick in your mind when visiting hotels in Panama. In the Caesar Park, for example, there is a small, lidded jar in the bathroom that contains Q-tips and cotton balls. And because it is a minor detail, it draws attention to the fact that nothing seems to have been forgotten. It is that attention to small touches – in addition, of course, to the important ones – that makes a hotel an award winner. Facecloths are another small detail. North Americans are used to them being provided, but you will not find them in all Panama hotels. 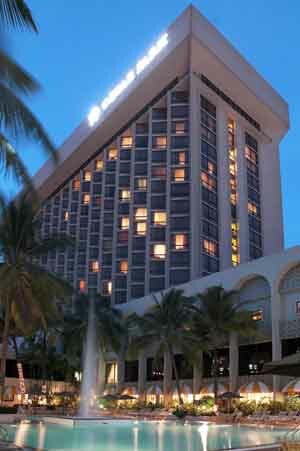 The Caesar Park was awarded the Five-Star Diamond Award by the American Academy of Hospitality Sciences for 2004. Unlike most hotels in Panama City, this one is a few miles from the city center (but only a $1.25 cab ride away). Across the street in an enormous convention center, and it is from this that the hotel draws a large percentage of its guests. If you want the best and don’t mind being a few minutes away from the city center and shopping, this could be the hotel for you.